The Intermediate Level texts and workbooks are the second of a five-level series (Beginning 1 and 2, Intermediate 1 and 2, Advanced Intermediate 1 and 2, and Advanced 1 and 2) developed collaboratively by leading classroom teachers and linguists of Korean. All series volumes have been developed in accordance with performance-based principles and methodology. Grammar points are systematically introduced with simple but adequate explanations and abundant examples, exercises, and drills. This book offers a comprehensive introduction to the linguistics of Korean. It presents essential facts about the language: its speakers, its relation to other languages of the world, historical development, dialects (including the differences between South and North Korean), writing systems, the composition and structure of words, and sound patterns and syntax. It provides a wealth of examples and user-friendly descriptions that do not presuppose advanced knowledge of either linguistic theory or Korean on the part of the reader. PreSchool-Grade 6?Introduces Korean greetings, numbers, family, animals, colors, etc. using familiar melodies so that children can learn basic vocabulary and pronunciation. 23 songs are accompanied by lyrics written in Korean Hangul with a pronunciation guide provided. Includes English translations. 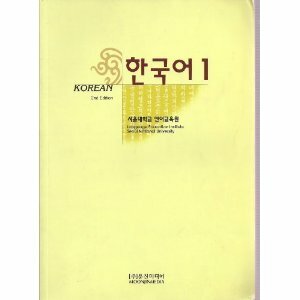 Copyright 1997 Reed Business Information, Inc.
Korean Textbook 외국어로서의 한국어를 배우려는 성인 학습자를 위해 서울대학교 언어교육원이 개발한 한국어 교재 시리즈 중 첫번째 단계의 책이다. 이 책은 한국어 지식이 전혀 없는 학습자가 일상생활에 필요한 기초적인 의사소통능력을기르도록 하는데 목적이 있다. 듣기, 말하기, 읽기, 쓰기가 기능별로 통합되어 연계활동 가능하며, 문법과 구문 연습을 통해 학습자의 기초적인 의사소통능력을 개발시킬 수 있다. The classic coloring books Teach Me Korean and Teach Me More Korean are now combined into a new 48 page bind up edition. This new edition includes the original coloring pages from both titles with a 60 minute audio CD. Teach Me Korean and More Korean also features six new pages of expanded vocabulary and activities. Includes Audio CD. The Elementary Korean Workbook is a companion volume to the new Second Edition of Elementary Korean by Ross King and Jaehoon Yeon, also available from Tuttle Publishing. This workbook contains dozens of exercises covering each of the textbook's 15 chapters, and helps you build the grammar, vocabulary and comprehension skills you need to excel in Korean. Korean Vol.2 is also an introductory-level textbook, a little more advanced than Korean Vol. 1, and it contains mainly essential everyday conversations. 『한국어 2』는 『한국어 1』보다 약간 높은 기초 단계의 책으로서 생활 필수 회화를 주 내용으로 하고 있다. 『한국어 1』과 마찬가지로 한국 생활에서 꼭 알아야 할 주제를 중심으로 한국의 문화, 사고방식을 소개하고 있다. 『한국어 1』과 마찬가지로 전체를 10과로 나누어 구성을 같게 하였고, 문법도 외국인이 쉽게 습득할 수 있도록 체계적으로 하였으며, 난이도를 고려하여 기본적인 것에서부터 단계적으로 올라가도록 꾸몄다. Barron's intensive language immersion course in Korean has been updated for Fall 2005, with 12 compact discs to replace the previous edition's tape cassettes. Originally created by the Foreign Service Institute to train diplomatic and other U.S. Government personnel serving in foreign countries, this program consists of a book that presents a detailed grammar course and vocabulary instruction plus approximately 14 hours' audio training to develop students' listening comprehension and conversational skill in Korean. The book may be purchased separately. Barron's publishes FSI language-learning programs in nine different languages.